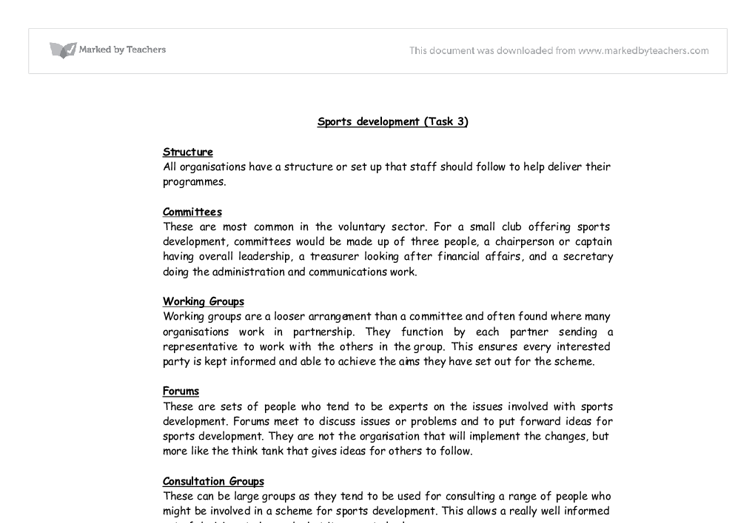 Sports development (Task 3) Structure All organisations have a structure or set up that staff should follow to help deliver their programmes. Committees These are most common in the voluntary sector. For a small club offering sports development, committees would be made up of three people, a chairperson or captain having overall leadership, a treasurer looking after financial affairs, and a secretary doing the administration and communications work. Working Groups Working groups are a looser arrangement than a committee and often found where many organisations work in partnership. They function by each partner sending a representative to work with the others in the group. This ensures every interested party is kept informed and able to achieve the aims they have set out for the scheme. Forums These are sets of people who tend to be experts on the issues involved with sports development. Forums meet to discuss issues or problems and to put forward ideas for sports development. They are not the organisation that will implement the changes, but more like the think tank that gives ideas for others to follow. Consultation Groups These can be large groups as they tend to be used for consulting a range of people who might be involved in a scheme for sports development. ...read more. They might need guidance on safety factors and requirements for disabled athletes. Participation Sports development organisations may fulfil a role that focuses on the participation level of the continuum by helping to increase the number of people who actually take part. These can be across age ranges, ability levels, gender and sports. Participation programmes can have several aims, such as to keep people playing, attracting old players back or lifting the level of participation from novice to intermediate level. Motivations are also varied and include enjoyment, fitness, new skills and social contact, so schemes have to match these in their content. Performance For organisations dealing more with the performance end of sports development continuum, a more targeted or sports specific approach is followed. These sometimes known as methods aimed at excellence the highest level of the continuum, and something that will receive a lot of focus in the period running up to the London Olympics. 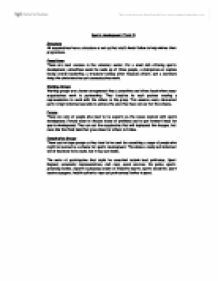 Sports Development officers A sports development officer is someone who is employed by a local authority or large club. There are three main types' of sports development officers: * Sports-specific - development officers are employed to cover the development of one sport such as rugby, football or tennis * Non - sports specific - development officers are employed to cover a range of different sporting activities. ...read more. of equipment * Problem-solving techniques * Organisational culture - elements of pride, professionalism and standards Charter Mark Charter Mark is an award that can be attained by any public sector organisation or department, such as a museum, art gallery or even refuse collection. It is an easy to use quality system designed to help everyone in the organisation focus on and improve customer service. Achievement of the standard is recognised by awarding the right to display the prestiougous Charter Mark logo, which is much sought after by sports development units in the public sector. The publicity material about the award says that Charter Mark is more about achieving a change of culture (to help target groups) than winning a trophy, but change and improvement must be ongoing. Those seeking a Charter Mark have to demonstrate that: * They offer choice to their customers so that a wide range of needs are catered for * Participants and staff are consulted on where choices can be made, and communities have a say in the design and delivery of local sports development programmes * Continuous improvement is sought, which means new targets are set every year at slightly higher level or lower cost To achieve the award, sports development units have to show that staff are involved in planning services and are encourages and given the power to put things right wherever possible. ...read more. ball situation, a player may be required to balance on the edge of the court and still have time to pass the ball before landing outside the court. This requires a small amount of balance skill. For this reason I will not be focusing on this during my tests. so when the player leaves the session he/she feels happy and has enjoyed the session. Being a motivator is a vital role of an effective sports leader. Sports leaders need to be able to motivate their group to keep them interested in the sport. However, when the competition gets closer, she becomes less anxious and is able to reduce any negative thoughts, to a point at where it benefits her performance on the day. Many sports psychologists devise ways to find intervention techniques to make athletes feel less stressed, at ease and comfortable prior too and during competition.